RUB A535 Coupon is a printed coupon. You can find this coupon at SmartSource.ca. Visit their coupon site, select the A535 coupon, and click on the ‘Print Now’ coupon. You can use printed coupons at most major retailers. I’ve used printed coupons at Loblaws, Metro, Shoppers Drugmart, Walmart and more. 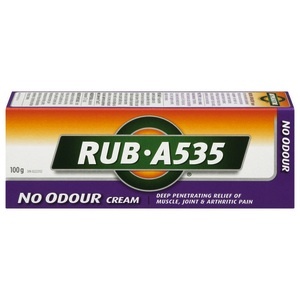 This is a Rub A535 coupon to save $1.50 on any Rub A535® cream product. Your busy schedule doesn’t leave time for constant re-application. RUB·A535® No Odour Cream is specially formulated to provide odourless and long lasting relief from arthritic and muscle pain.